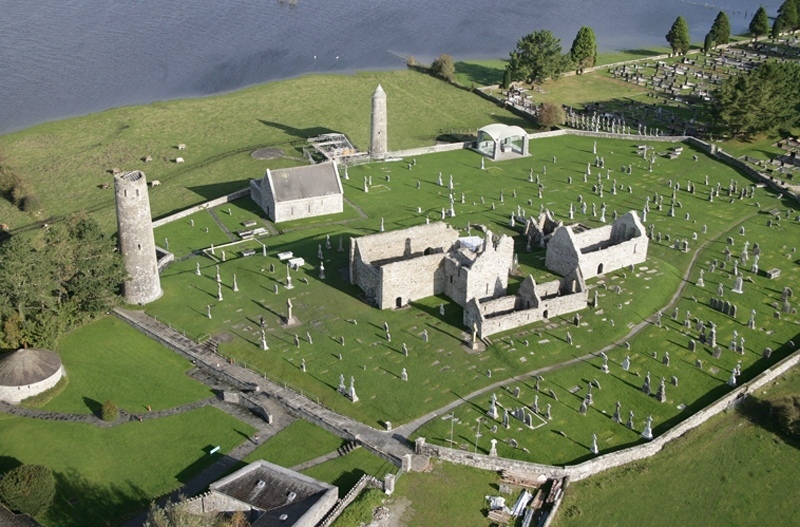 The ecclesiastical complex at Clonmacnoise is truly an amazing place. 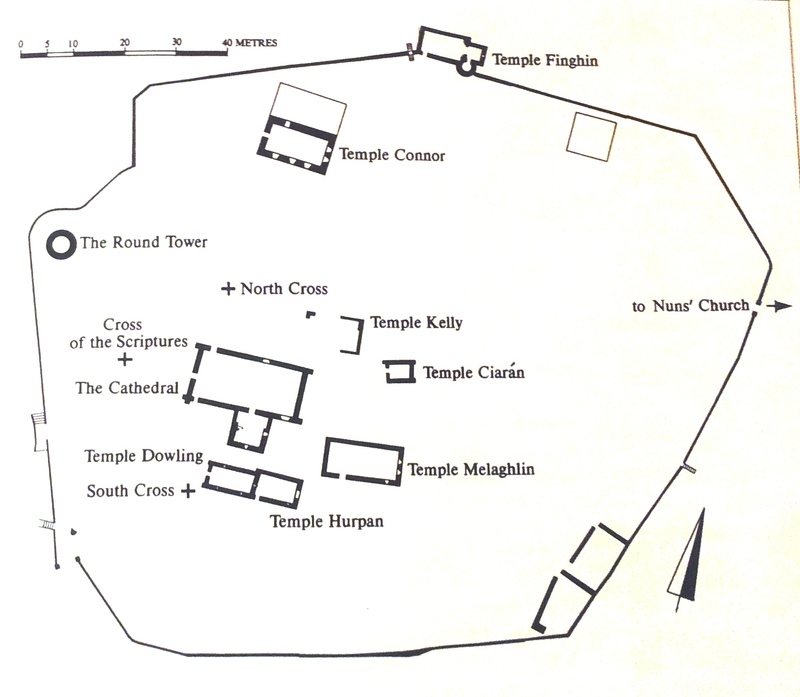 Founded by St Ciarán in 545, the site developed into a vast ecclesiastical complex and became one of the great power houses of the medieval church in Ireland. I have visited Clonmacnoise on many occasions and each time I spend hours walking around , there really is so much to see here. 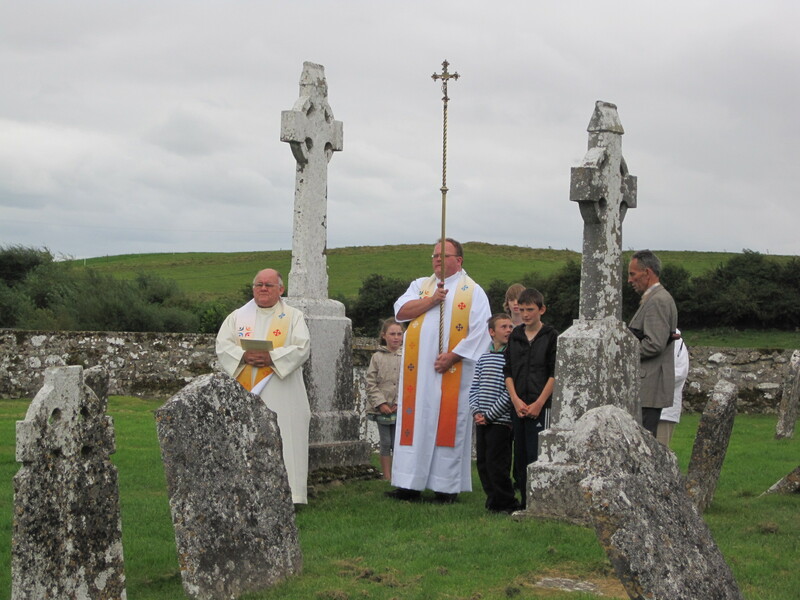 This visit coincided with the Pattern Day celebrations of St Ciarán’s feast day on the 9th of September. 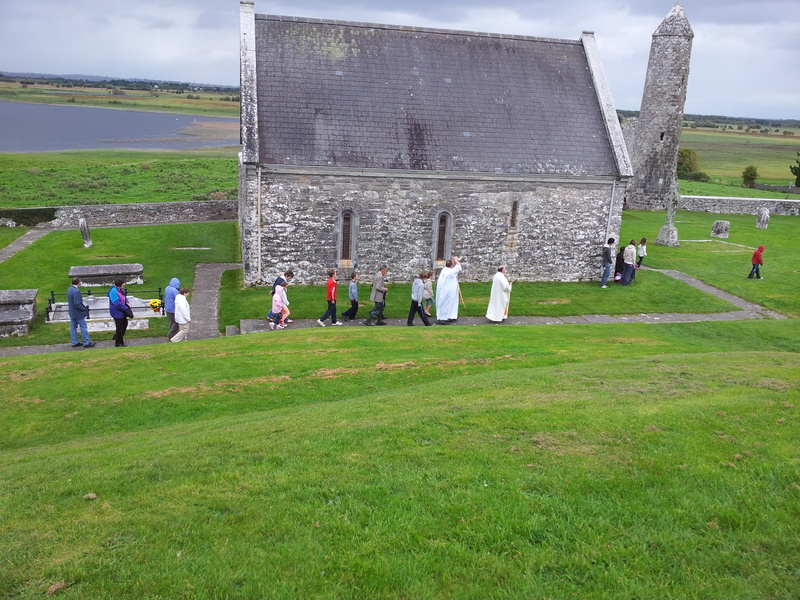 Clonmacnoise is one of the very few Irish ecclesiastical sites to have an unbroken tradition of pilgrimage that stretches from the 6th /7thcentury to modern times. 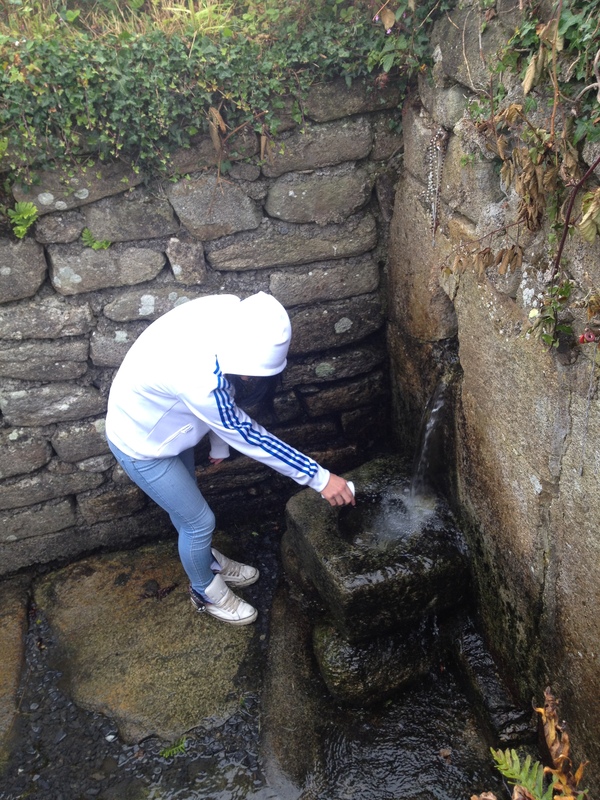 The history of pilgrimage during the early to late medieval period and the early modern period is very interesting and complex and is best discussed in more detail in another blog post. 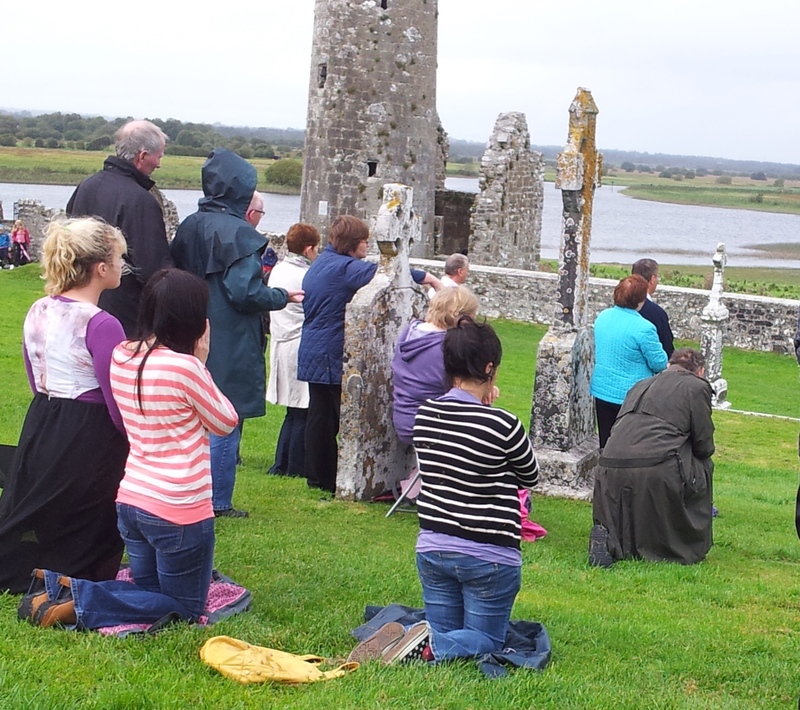 According to the Clonmacnoise Heritage Centre there are two special days of devotion here at Clonmacnoise. 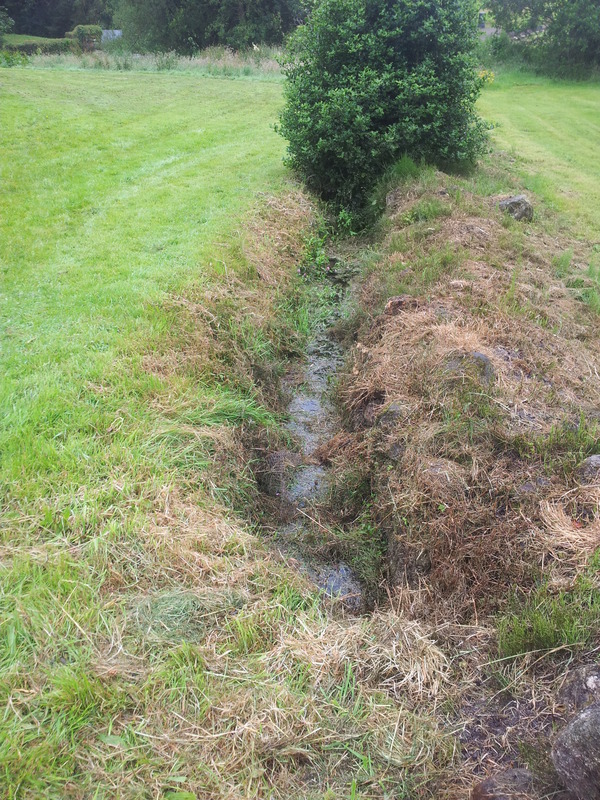 The Church of Ireland hold an open air service on the last Sunday in July which I hope to attend next year, while the annual St Ciarán’s Pattern Day is held on the third Sunday in September, or if possible celebrated on the 9th of September (St Ciarán’s feast day) as it was yesterday. The Pattern celebrations began around 3pm. From around 2.30 pm people began to come into the main ecclesiastical complex in small groups and before the main celebrations began there must have been well over a 100- 150 people present. A local man I spoke too said that even more people would normally be present but the All Ireland final between Kilkenny and Galway had kept many away. 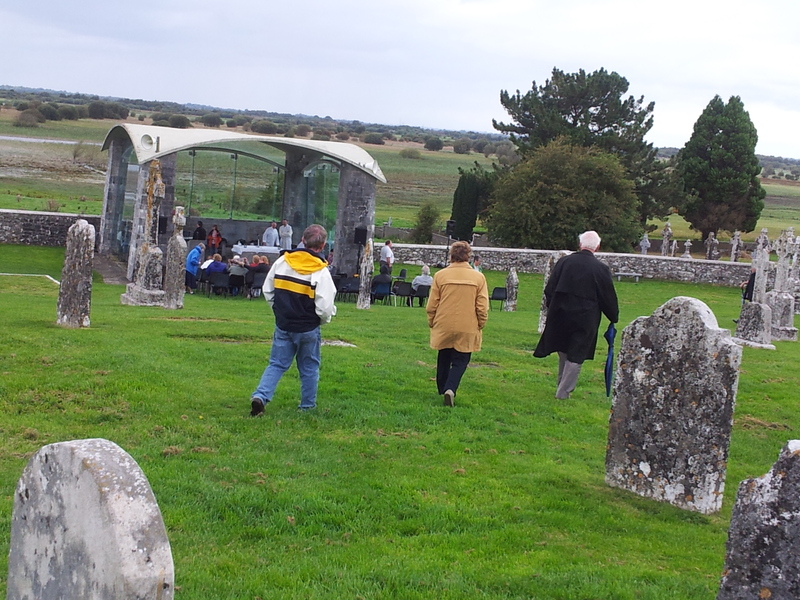 the rest of the pilgrims were scattered among the gravestones and the ruins of other churches at the site. 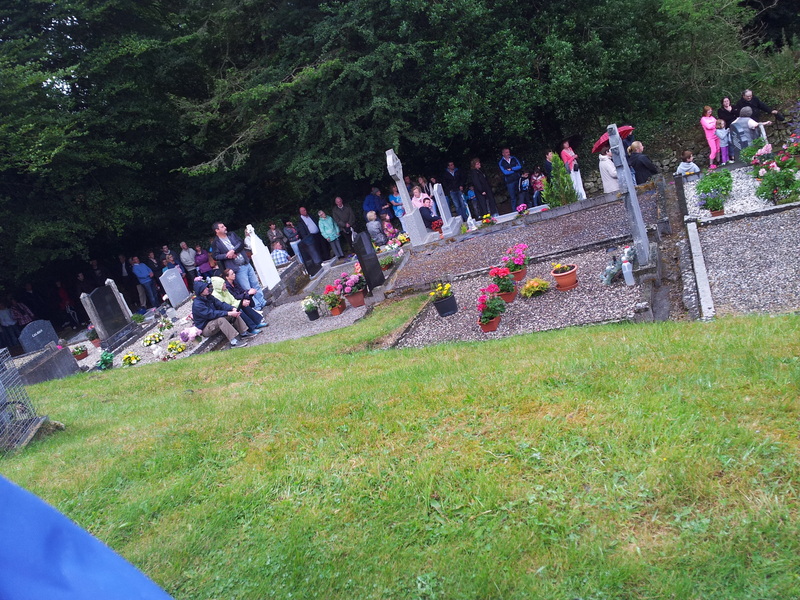 Like the Pattern at St Mullins, there is also a social element to this occasion, this it is time for people to catch up and chat, it is also a time for people to remember those who have died. 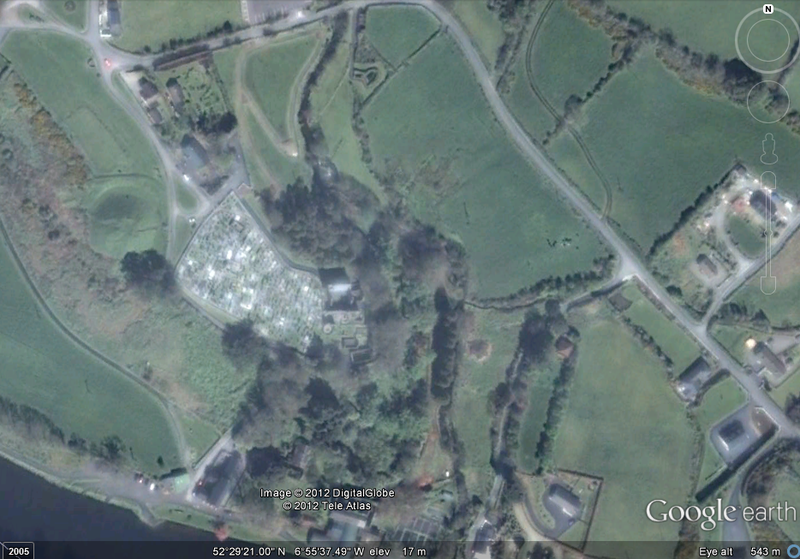 Many of people who attended the pattern also visit the graves of loved ones buried within the main complex and the modern graveyard beside it. 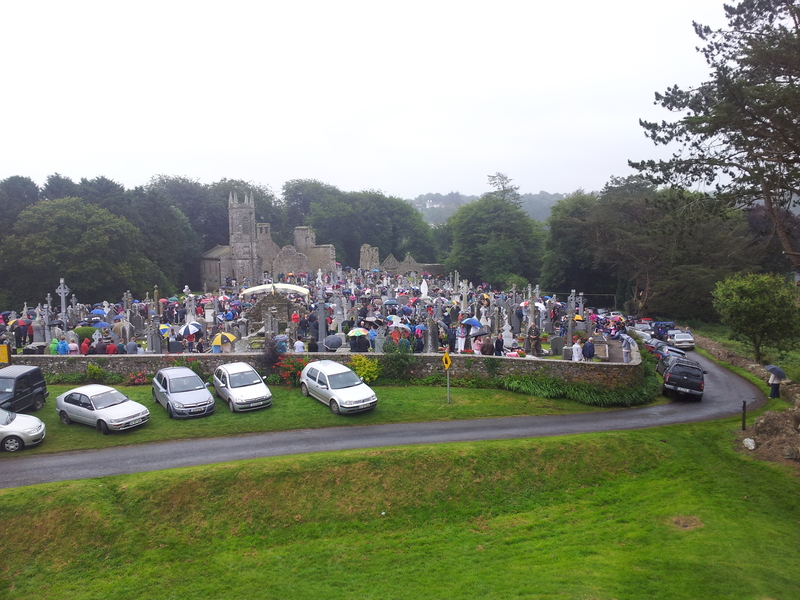 Visiting of the graves takes place before and after the Pattern Day mass. 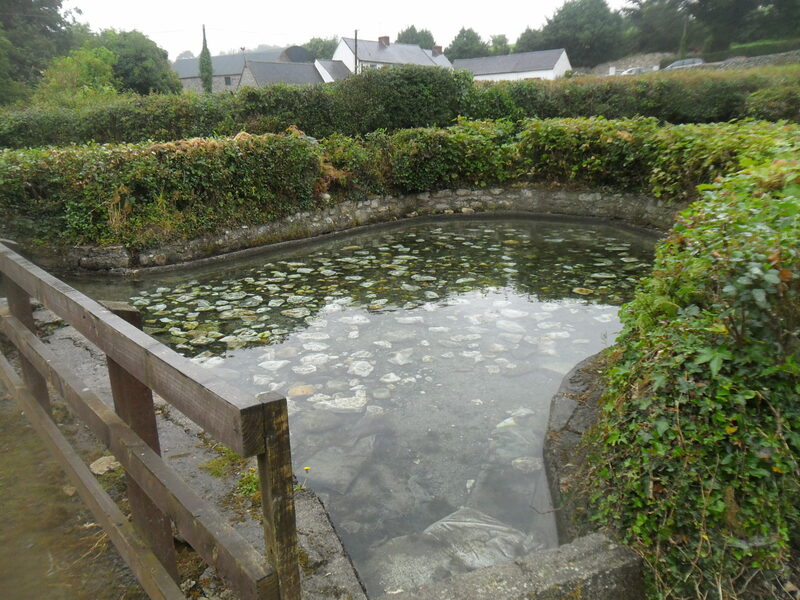 During the nineteenth century and up to recent times St Ciarán’s well, located a short distance away on the Shannonbridge road, was a central part of the Pattern Day. 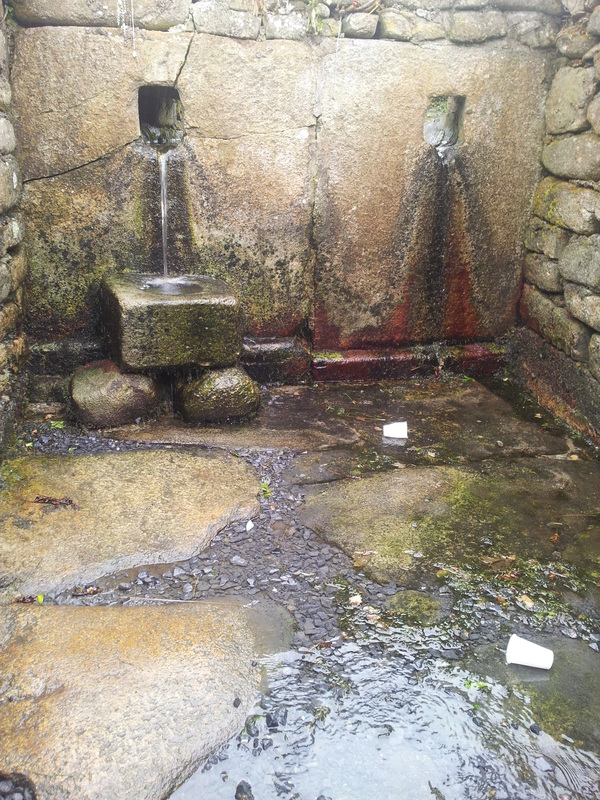 According to one lady that I spoke too, mass and the stations here are now the main focus of pilgrims but some people still visit the well on the saints feast before or after the mass. 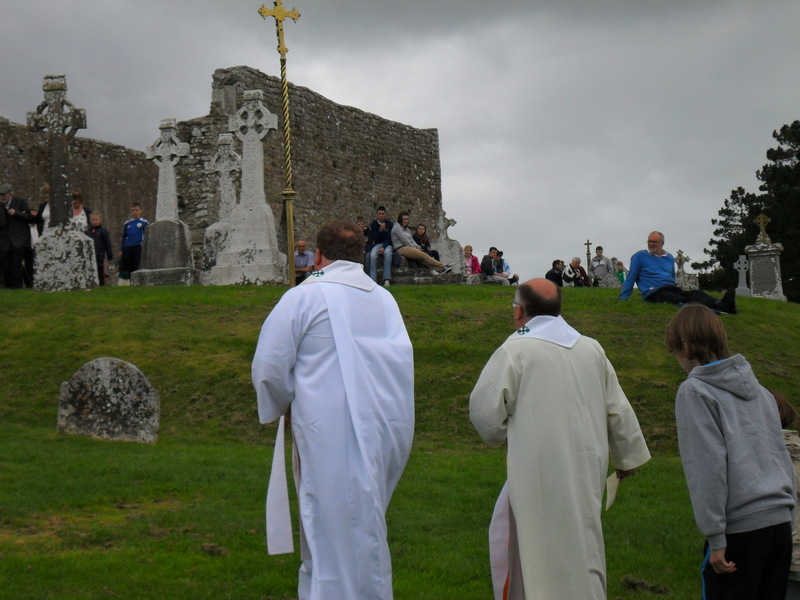 Clonmacnoise is part of the Catholic Diocese of Ardagh and Clonmacnoise. St Ciarán is one of the patron saints of this diocese. 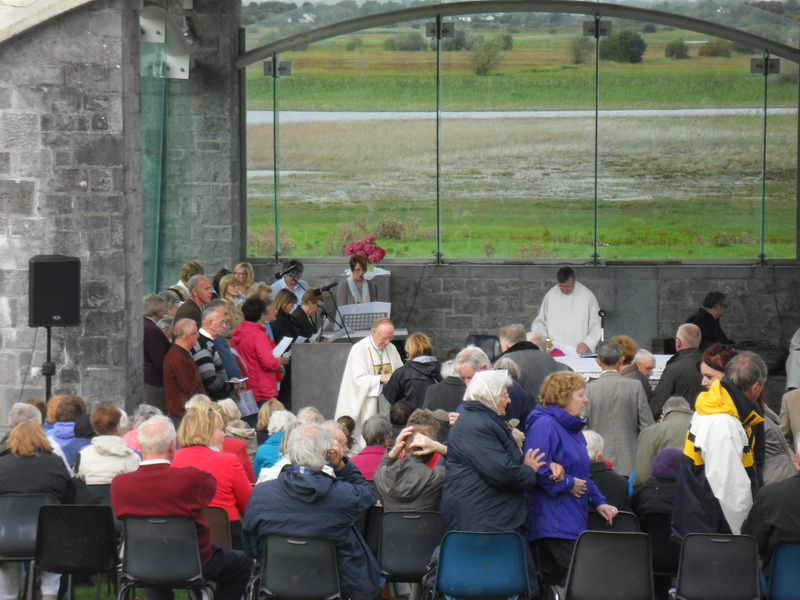 The pilgrimage is an import part of the Diocesan Calendar, so much so that the Bishop of Colm O’Reilly officiated at the mass, aided by 11 priests. 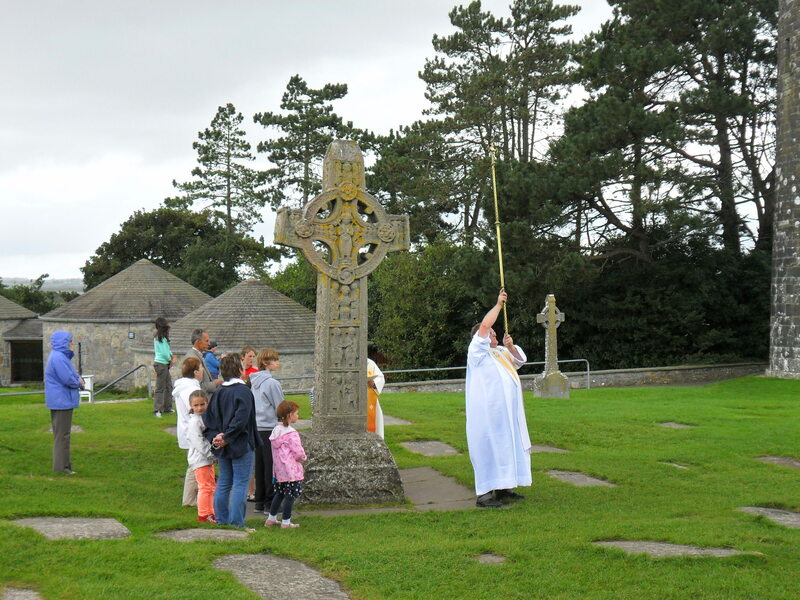 The pilgrimage began with the procession of the ‘Pilgrim Cross’ (a processional cross) around the monastic complex while the rosary was recited. Local people were invited to join in the procession but most preferred to pray where they were and only a small group of people joined in the procession. 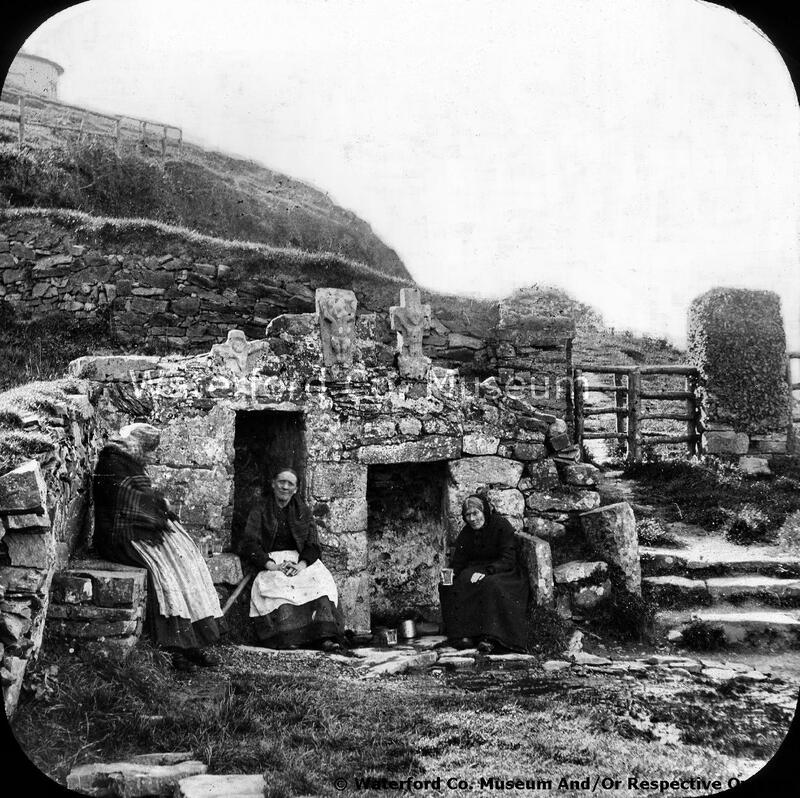 The first station began at the small oratory known as Temple Ciarán, the traditional burial-place of St Ciarán. 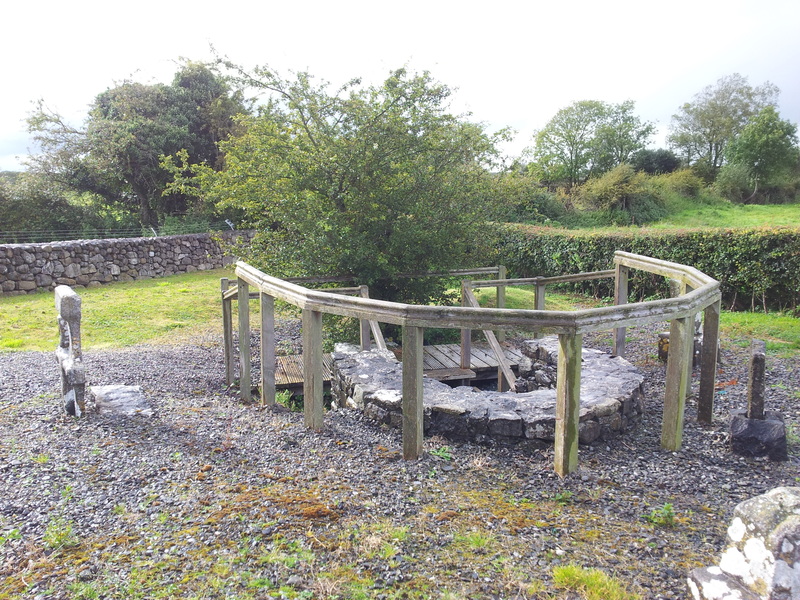 The Pilgrim Cross then moved to the second station at the top of the enclosure among the gravestones. The cross was then carried on to the third station at the Cross of the Scriptures opposite the Cathedral church. The Pilgrim Cross then moved on to the fourth station was at the Round Tower. 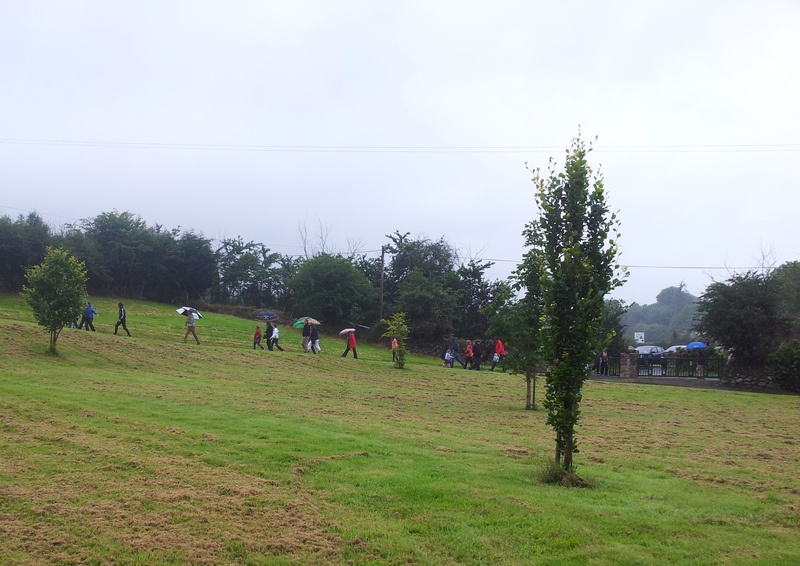 The Pilgrim Cross was then brought on procession down to Temple Connor the fifth station. 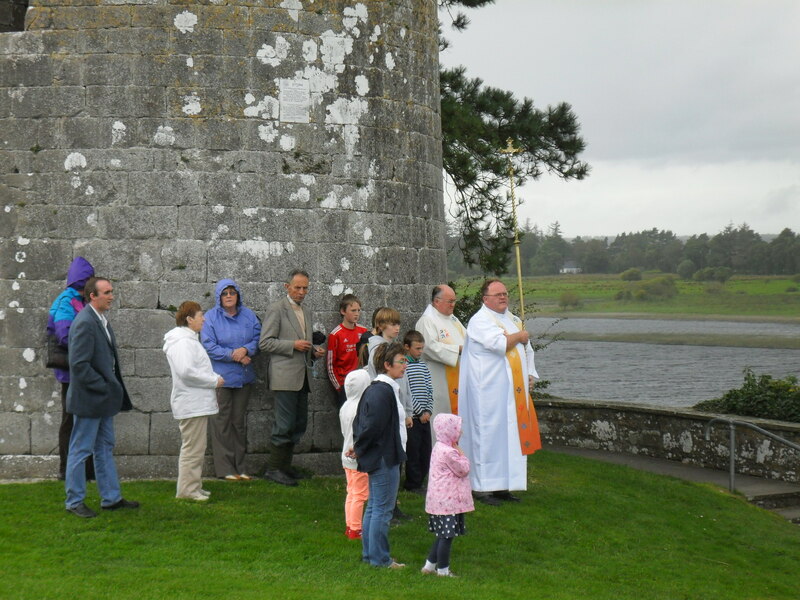 This is the only church at Clonmacnoise which is still use, built in 1010 by Cathal O’Conor, it has been used as a place of worship by the Church of Ireland since the eighteenth century and services are still held here. 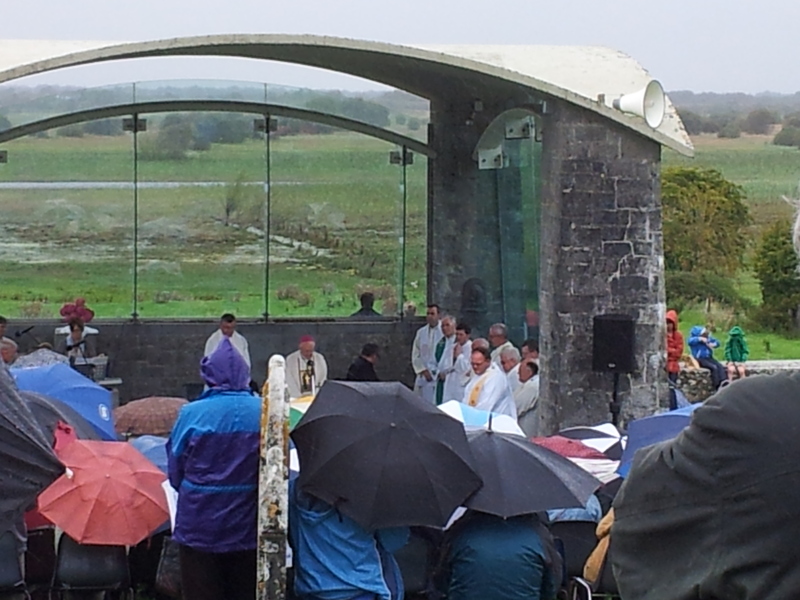 The stations ended with the bishop reciting a litany of the saints of Ireland . 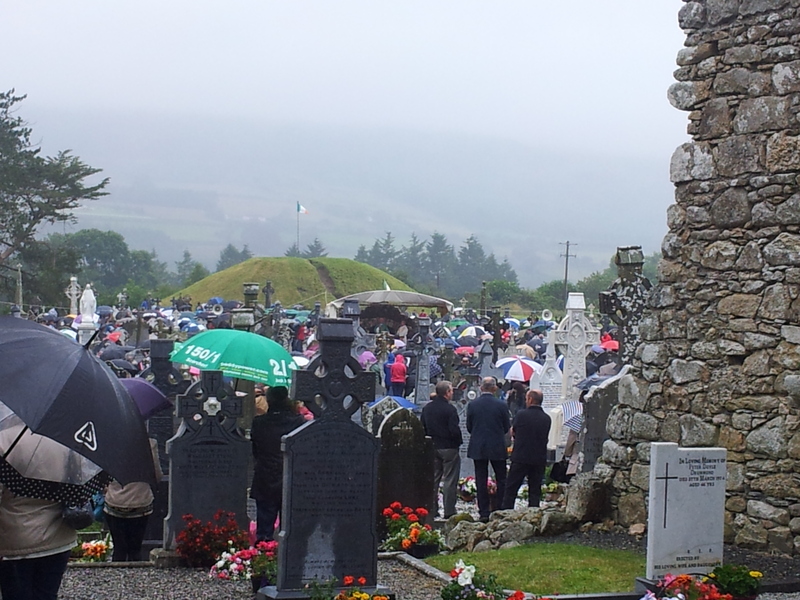 The mass began and just as the sermon was being delivered by Fr Liam Hickey PP of St Ciaran’s parish Hartstown , Dublin, who was originally from this area, the heavens opened and the Clonmacnoise became a very pretty sea of colourful umbrellas. 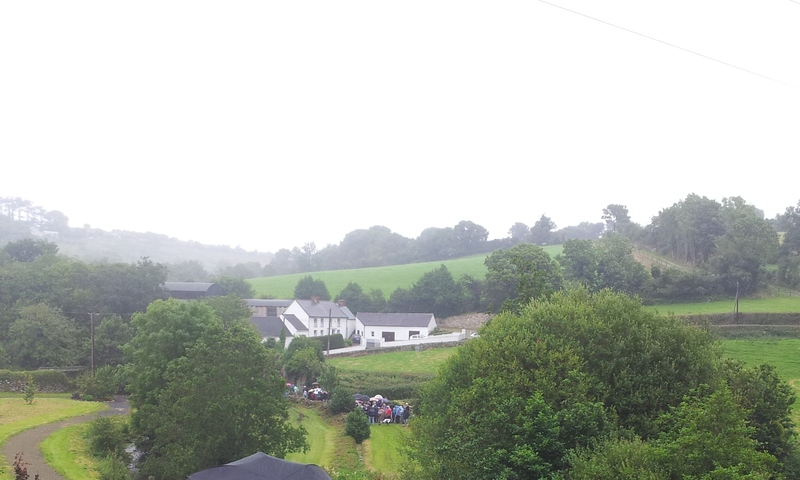 As quickly as it began the rain cleared away. As the mass continued a few curious tourists looked on taking photos, perhaps wondering what was happening. 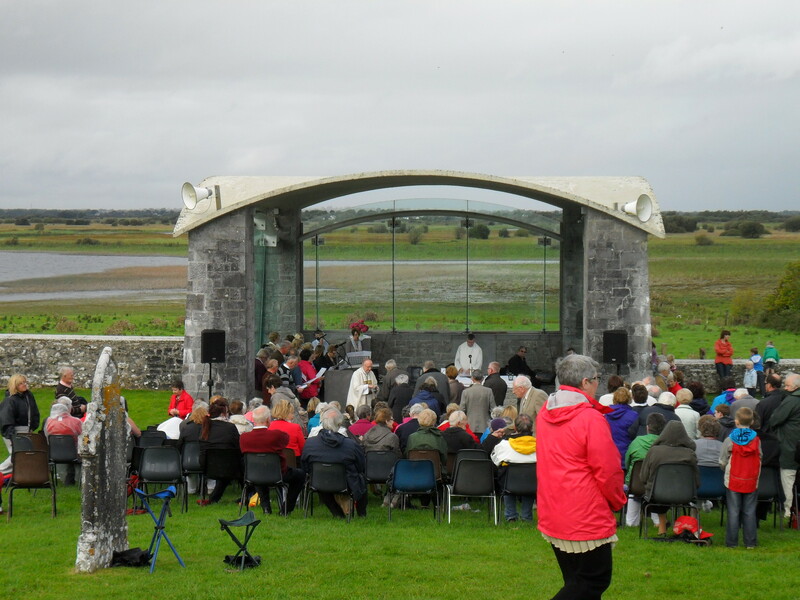 Looking around at the Clonmacnoise I really felt like the site was transformed from a museum into a living place belonging to the community. 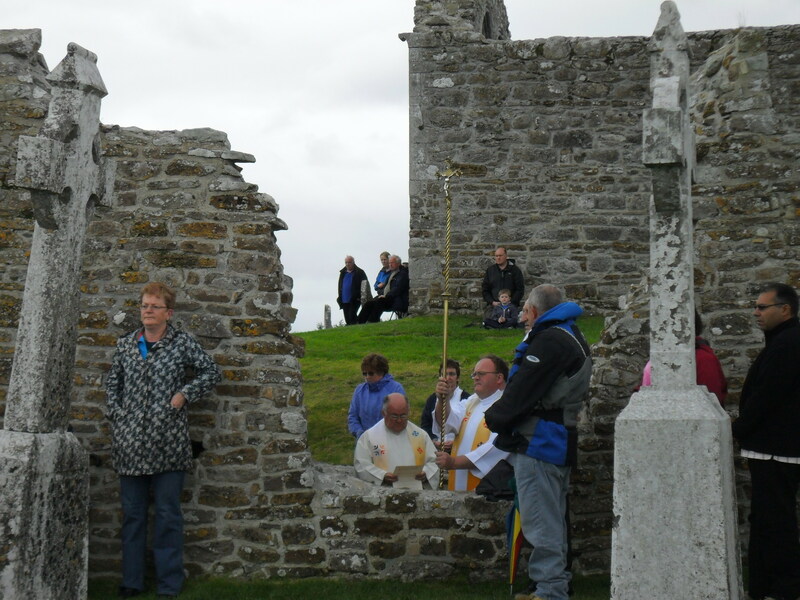 There was also a real sense of history and tradition, the pilgrims scattered around the site were following the same age-old traditions of their ancestors, arriving here to celebrate St Ciarán just as their parents and grandparents had done before them and their parents before them and so on. 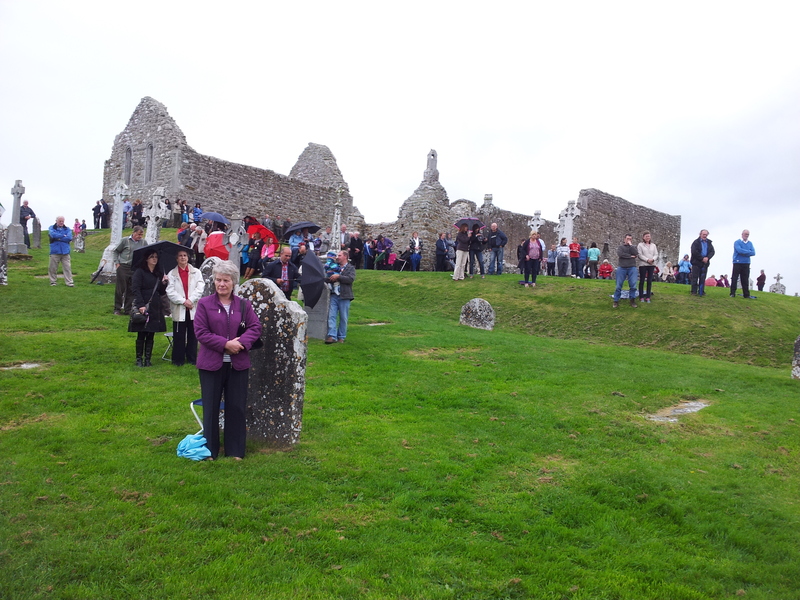 As I will discuss in another post on Clonmacnoise the pilgrim rituals have changed through the centuries but the core act of pilgrimage, the community coming together in honour of their saint on his feast day is unchanged and I feel really lucky to have been here to experience this.